The Goliath bird-eater (Theraphosa Leblondi ) . "Another biggie". The Goliath is the worlds largest spider, specimens can grow to over thirteen inches leg span, and weigh over six ounces. 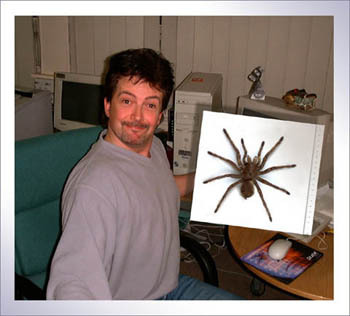 I have kept Goliaths for many years and I am always amazed by the rapid growth, a spiderling I obtained just over a year ago is already at around eight and a half inches leg span.The specimen I am holding in the photo is a huge male, the females are usually slightly shorter on the legs but much more stocky in there build. Between the Goliath bird-eaters and the Giant centipedes all insects and small vertebrates are at risk of becoming a meal as night falls in the Amazon.